Marcus Maddison’s quickfire double gave Posh their first points of the season as they came from behind to beat Colchester United at the ABAX. All three goals came in a mad five minutes in the first-half, with Macauley Bonne giving the visitors a deserved lead after half-an-hour only for Maddison to strike a cross straight into the net before his 20 yard effort was pushed into the net. The five minute goal-rush was made even remarkable by the fact that it appeared Maddison could be substituted straight after Colchester’s opener with Posh struggling. 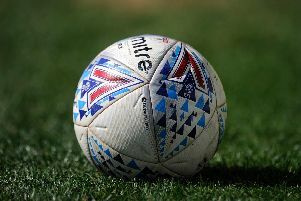 In the end, though, the winger’s goals were enough for the win although Colchester will feel very aggrieved that Posh goalkeeper Ben Alnwick was not sent off for a handball outside the area. The first half-an-hour was a poor spectacle with Conor Washington stabbing wide a volley from an awkward height and Bonne glancing a header wide from a Richard Brindley right-wing cross. Defensively Posh’s shape was terrible and they were unable to keep the ball. On more than one occasion they gave the ball away in their own half and had to recover the situation. Slower than their opponents and resorting often to long balls, it was no surprise that Posh fell behind. Moments earlier they had been fortunate when Gavin Massey’s through ball to George Moncur was overhit with the midfielder set to race through. But Moncur was soon on hand to help his side into the lead. With Kgosi Ntlhe once again nowhere to be seen, a ball out wide beat Maddison’s attempt to cut it out. With the winger then failing to track back, Moncur had acres of space to put a low ball across goal for Bonne to fire into the net from about eight yards out. According to the club’s own media team, Posh manager Dave Robertson was about to make a double substitution which, they believed, would have included taking off Maddison. Having been booed by his own fans in the season opener at Rochdale, it would have been interesting to see the reaction he would have received if he had been subbed after 30 minutes. Instead, just a minute later he was soon taking the cheers of the crowd after his cross from the left (it surely had to be a cross) ended up flying past Elliot Parish in the Colchester goal. Robertson told his subs to sit down and he was rewarded when Maddison capped off a mad five minutes by finding space 20 yards out and driving in a low shot which Parish - who is debutising for Colchester’s first-choice goalkeeper, Sam Walker - could only push into his own net when he ought to have palmed it to safety. Posh were on top for the rest of the half but they had to take off Tobi Adebayo-Rowling for Ricardo Santos after he suffered an injury. Alex Davey switched to right-back with Santos moving into the centre. The visitors also made a change before the break as the speedy left-back Matthew Briggs was taken off for Kane Vincent-Young after being clattered by Joe Gormley. The second-half started in much livelier fashion than the first, with Posh much more on the attack and Colchester looking to play on the break. Washington nearly grabbed his second goal in a week but was given offside to the frustration of the crowd who felt he was at least level when Maddison played him in. Darren Ambrose, set up by the impressive Moncur, then curled wide for Colchester from 25 yards after a quick break. There was controversy, though, just before the hour mark when Moncur played Massey in down the right and Alnwick came charging out of his goal and was penalised for making the tackle with his hand. It appeared a certain red card even if the player was still 25 yards out and very wide, but to most people’s surprise - and the anger of the Colchester fans and players - referee Mark Haywood only brandished a yellow card. Maddison, who was enjoying a decent second-half, had a low shot comfortably saved, while at the other end Ambrose blazed over after a good spell of pressure for the visitors. Robertson, who had made just one change from Tuesday’s win against Crawley by bringing in Jermaine Anderson for Jack Collison, switched the pair around in the second-half and brought on Jon Taylor for Harry Anderson. Both sides pressed for another goal, with Santos required to make a last-ditch clearance over his own cross bar with Massey lurking. Gormley, still looking for his first Posh goal, then dragged wide from a great position but Posh held out under late pressure to continue their fine record at the ABAX under Robertson and get their League One campaign up and running. Posh: Ben Alnwick, Tobi Adebayo-Rowling (sub Ricardo Almeida Santos, 38 mins), Gabriel Zakuani, Alex Davey, Kgosi Ntlhe, Jermaine Anderson (sub Jack Collison, 69 mins), Michael Bostwick, Marcus Maddison, Harry Anderson(sub Jon Taylor, 78 mins), Joe Gormley, Conor Washington. Subs not used: Dion-Curtis Henry, Shaun Brisley, Kyle Vassell, Souleymane Coulibaly. Colchester: Elliot Parish, Richard Brindley, Alex Wynter, Tom Eastman, Matthew Briggs (sub Kane Vincent-Young, 45 mins), Joe Edwards (Sammie Szmodics, 79 mins), Alex Gilbey, George Moncur (sub Dion Sembie-Ferris, 64 mins), Gavin Massey, Darren Ambrose, Macauley Bonne. Subs not used: Chris Lewington, George Elokobi, Drey Wright, Frankie Kent.